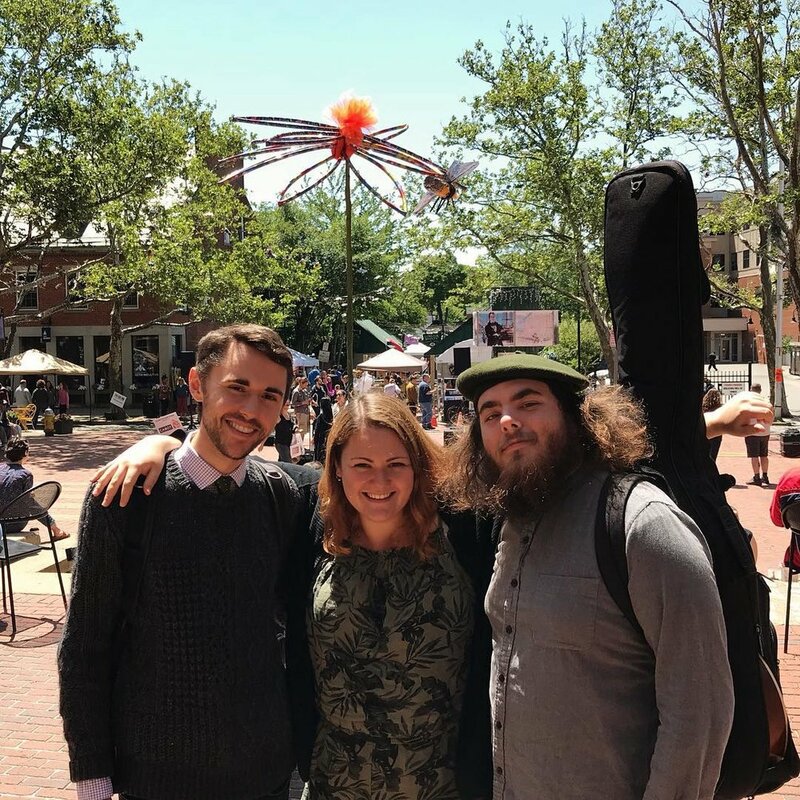 StompBoxTrio is a Western Mass based acoustic roots project that reaches deep into the wellspring of vintage American blues, gospel and soul to create a thick gumbo of hip-shaking, foot stomping 21st century Americana. You can see the Stomp Box Trio perform on Saturday the 14th from 11.00 - 12.15, 1.00pm-2.15, and 3.00pm - 4.15. They will be located on the corner of Main street and the Post road. Emma Charles is a folk/pop singer songwriter from Westport, CT. She is in her last and final year at Berklee College of Music in Boston Massachusetts where she will be completing her Bachelors in Music in 2019, and she will be majoring in Professional Music with concentrations in performance and songwriting. Being a multi-instrumentalist, (voice, piano, guitar), she utilizes all of her talents to create music that is new, unique, and fresh but complete with the integrity of an old soul. Emma has music released on all platforms, and hopes to share her journey through adulthood and her exploration of the world around her (and where she fits in it) with all of her friends, family, and fans. You can see Emma Perform on Saturday the 14th from 11.00-12.20pm, 1.00pm-2.20pm, and 3.10pm-4.40pm. She will be located on Church lane. Emma is a promising 20-year-old international jazz artist. Primarily based out of New York, NY and Boston, MA, she attends the prestigious Berklee College of Music. Currently, Emma is going into her last year at Berklee, studying voice and trumpet in the Performance Major. She was accepted into the school as a recipient of the North American Tour Scholarship. While attending Berklee, she has also received the Berklee Achievement Grant and Voice Department Achievement Award for her successes. So far in her career, Emma has studied with jazz greats Sheila Jordan, Alison Wedding, Maggie Scott, Christine Fawson, Peter Eldridge, and Steve Zegree among others. Last fall, Emma spent 5 months in Europe, studying in Valencia, Spain, and traveling/playing shows. She plans to return to Europe for her final semester at Berklee (Spring 2019) and stay based out there after graduating. Currently, Emma can be found performing throughout the American Northeast either solo or with one of her groups. She has performed at private and public venues around the globe such as, NEL Brasserie (Amsterdam), Jazz at Lincoln Center (NYC), Wally’s Cafe (Boston), the Upper Club (Valencia), Amherst Brewing Company (Amherst), and the Lilypad Inn (Cambridge) to name a few. You can hear Emma Sundvick perform on Saturday the 14th at 11.00am - 12.30pm, 1.15pm -2.30pm and 3.15pm-4.30pm. You can watch Moving In Stereo perform on Sunday the 15th from Noon to 4.30 with two 30 min breaks. They will be located on Brooks Corner. Rob Morton is a singer/songwriter from Westport, Connecticut who just released his album, Private Moon. The first single off the album, Just One More Day With You, has received numerous awards from national shows, including Best Song and 3 Best Music Video awards. You can listen to Rob on Sunday the 15th from 11.30am-12.45pm, 1.30pm - 2.30pm, and 3.15pm-4.15pm. He will be located on Church lane. One night at a house party, two singers from Third Sister got together with the Tune Squad... and the B Side band was created. Their music includes favorites from soul, blues, Motown and R and B. Always tasteful, never too loud. A fun time out! These players have been out and about in Fairfield County over the last 20 years in various projects. Members are : Beth Mulkerin Iovinelli (vocals), Betsy Benham Fruda (vocals), Warren McGuire (guitar and vocals), Randy Stone (bass), and Joe Sullivan (drums). You can listen to them on Sunday the 15th from 11.30pm-12.45pm, 1.30pm - 2.30pm, 3.15pm-4.15pm. They will be located on the corner of the Post road and Main street.